When you have unwanted facial hair, you might think a trip to the salon or spa is in order to eliminate that hair and leave you with smooth skin. 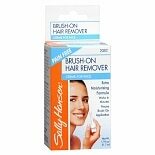 Thanks to Sally Hansen Hair Removal Cream available from us here at Walgreens, you can discover a simple way to eliminate unwanted hair at home. Learn how these Sally Hansen products can work for you. Then enjoy the convenience of these highly effective, budget-friendly hair removal creams. 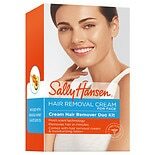 Sally Hansen Hair Removal Creams come in several styles, allowing you to find a simple way to eliminate unwanted facial hair. Rather than using hot wax, you can opt for a cream, which offers a pain-free way to erase facial hair. Creams can be applied with your fingers or brushed on using a convenient, mess-free brush that is included with your purchase. Simply apply the cream to the affected areas, let the formulas work their magic, and remove the cream along with the unwanted facial hair. Sally Hansen's fast-acting creams have a clean, fresh scent and efficiently eliminate embarrassing body hair. Rather than using harsh ingredients that have the potential to irritate your skin, Sally Hansen Hair Removal Creams rely on nourishing ingredients that actually benefit your skin while simultaneously removing unwanted hair. Vitamin E works to soften and smooth the skin. Pumpkin seed extract and willow herb extract have the potential to eliminate existing hair and minimize hair regrowth, which can lead to long-term benefits. Aloe and chamomile are other skin conditioners that nourish your skin while you're erasing stubble. The Sally Hansen brand launched in the 1950s in New York and, since then, has developed into a leader in the personal care industry. Today, Sally Hansen is America's number one brand in hair removal, showing that the Sally Hansen name is one that women across the nation trust. These innovative products are thoroughly tested with your safety in mind. Each Sally Hansen formula is assessed -- without the use of animal testing -- to ensure it is optimally safe for your skin. Rely on the brand that many women trust, and try Sally Hansen Hair Removal Creams today.